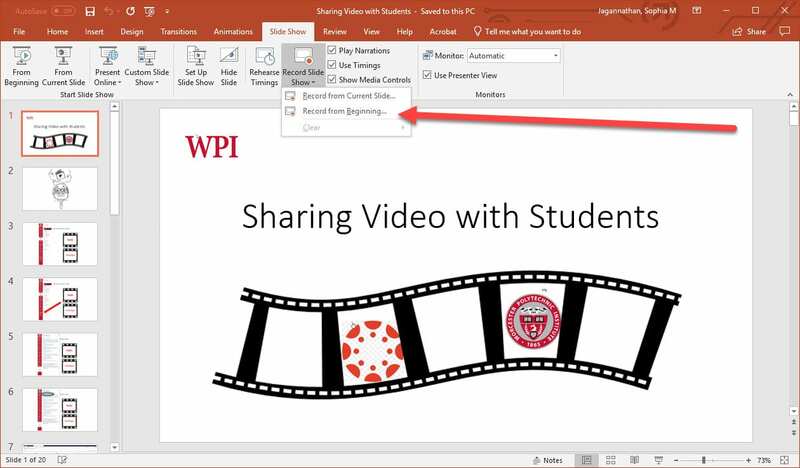 Since narrating Powerpoint files is a common way to create videos for courses, this blog post will illustrate a workflow for how to do this in conjunction with WPI’s video infrastructure. The first step is to create your slide presentation in Powerpoint. Then, when you’re ready to record, click on “slide show” and then “record slide show”. If you are creating the video for the first time, select the option to record from the beginning. Powerpoint will give you a three second countdown and then you may begin narrating your presentation. On the top left you’ll see the recording controls, and at the bottom you’ll see tools like the pen and highlighter. Your markings will be recorded. You’ll see I underlined the word “video” – which was the best I could do since my circles are rather squiggly. One you’re done, click on the stop button. If you need to re-record over a certain slide but don’t want to re-record the entire presentation, you can choose to record from the current slide. This will replace the audio that currently is stored there with new audio. Now that you’ve recorded your slide show presentation, save it. Now it’s time to share it with students as a video. To create a video file from your recorded narration, go to the file menu and choose Export. Then choose “Create a Video”. This creates a video file. 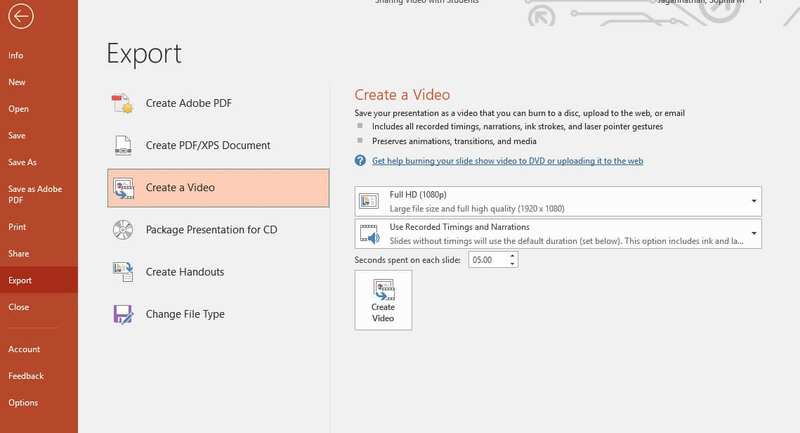 To upload your video file to Echo360, follow these steps. First, login to Canvas. Navigate to your course. Now, click on Echo360 on the left menu. From here, click on the Echo360 logo on the top left. This brings you to your Echo360 “home” page. From here, you can upload the video. But wait – there’s more! This uploads the video to your Echo360 library. That’s great – but it doesn’t mean that the students can see it. To enable the students to see it, you must remember your rules of kindergarten and SHARE it with them. Once the video has finished processing in Echo360, click on All Content on the left side menu. This will show you thumbnails of all the videos of which you are the owner. Hover over the video you want to share and then click the blue box on the bottom right of the thumbnail. This releases a drop-down menu. Choose share. 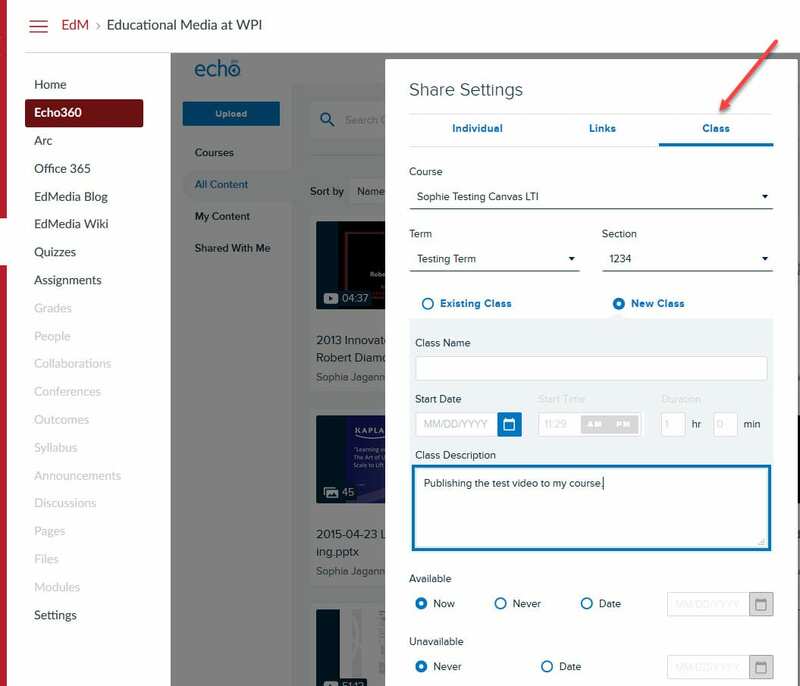 When you click on share, you’ll see options to share to an individual, generate links or share with a class. 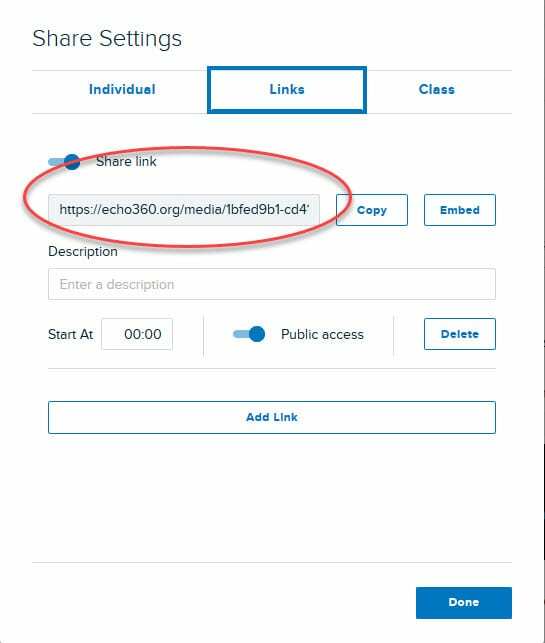 To create an instantiation of the video in the Echo360 list of videos that your students see when they click the Echo360 button, click on class. To create a link that you can post as an External URL content item in a module in Canvas, choose links. And that, in a nutshell, is the Powerpoint to Canvas pipeline via Echo360. 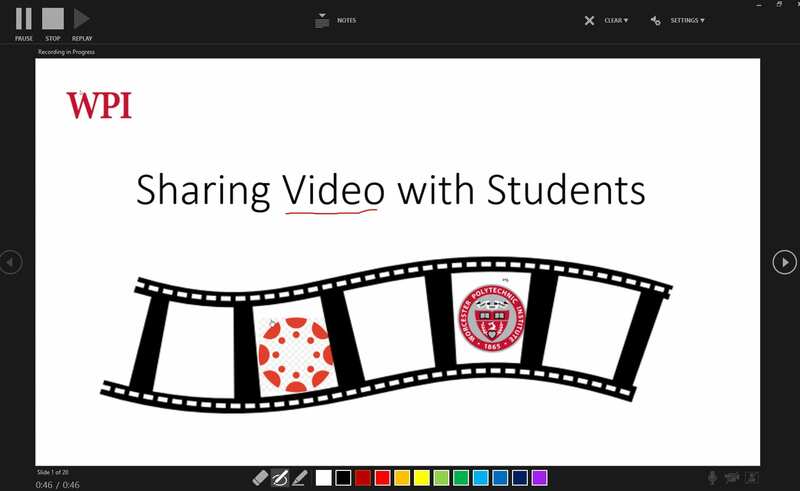 I hope this blog post has been helpful in teaching you how to create a video from your Powerpoint slide presentation, convert it into a video, upload it to Echo360 and share it with your students. If you have any questions, please email edmedia@wpi.edu.